My acts of Other People's Happiness are usually small things to brighten up some one’s day. They're often temporary bursts of happy, not lasting effects on someone's life. I recently learned one of my small gestures made a difference when I finally met the stranger I’d helped years ago. This year a project I was working on called for young, inspirational Australian talent. 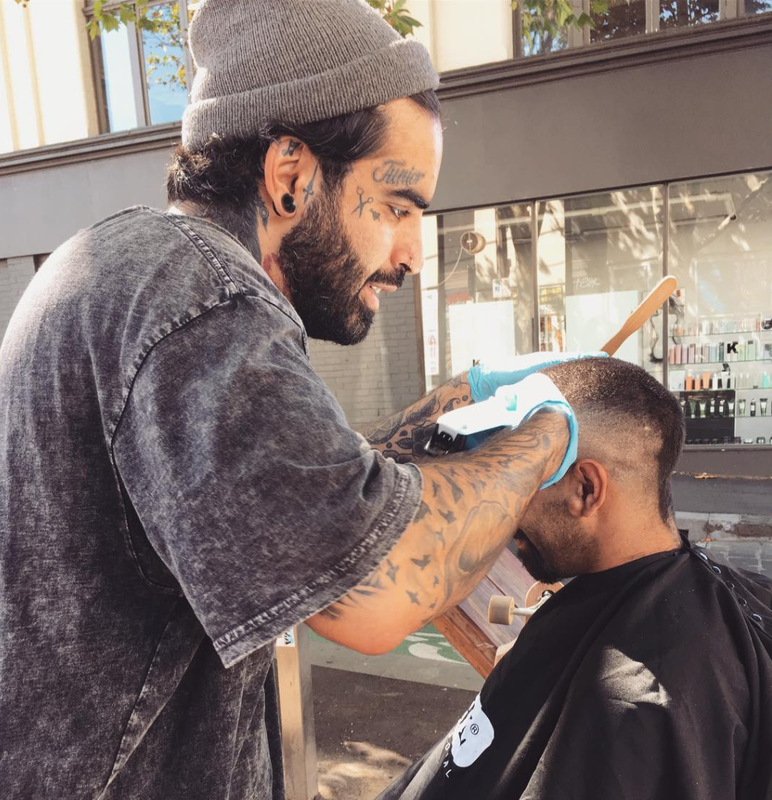 I couldn't think of anyone better than Nasir Sobhani, The Streets Barber, who gives free haircuts to the homeless on his days off from work. It had been years since we'd been in touch, but when I contacted him he was happy to take part. On the day he flew to Brisbane, I'd considered going on-set to say hi but didn't want to crowd the team so decided to leave them be. A colleague at the shoot told me Nasir wanted to meet me and thank me in person so I made the trek over. I'm so glad I did because I learned how he's gotten his life into an amazing place the past few years. When I introduced myself, Nasir gave me a big hug and told me he wouldn't have done this project if it wasn't me who had asked. He said yes because he wanted to return my good karma from way back when. My heart nearly burst when he told me. What a kind soul! He flew interstate and gave up his day for me because of one small act years back. Years earlier I'd reached out to a stranger whose inspirational story moved me to take what little action I could. I was watching The Project on TV when they interviewed a young man who was recovering from addiction, trying to get his life together and walking the streets of Melbourne giving free haircuts to the homeless so that they could have a clean start like he did. He was also looking for paid barber work. I found his contact details on Instagram and asked if he'd like an introduction to my former employer, who had a barbershop in their store. It was the only thing I could think to do. I couldn't guarantee a job but it was worth a shot. Would you believe it was Nasir's dream to work there? He, being super talented and humble, of course got the job and that's where our story ended. Until recently. At the shoot, I learned that Nasir finished his studies, and the work experience he got with my old employer helped him get sponsored by another barbershop so he could stay in Australia (speaking of, this Canadian has just been nominated for the 2017 Australian Of The Year Award). Wow! I love when life gives back to good people who do so much for others. Nasir told me he's got exciting things on the horizon that will spread the love and good karma even further than he ever imagined. If you want to follow his journey like I do, check out his Instagram @thestreetsbarber. His posts serve as a reminder that there are good people in the world doing good things, inspiring others to do the same. I feel blessed to have played a small part in his journey, and can't wait to see what this remarkable human does next.